Alberta is one of Canada's prairie provinces, joining the confederation on September 1, 1905. It is located in western Canada, bounded by the provinces of British Columbia to the west and Saskatchewan to the east, the Northwest Territories to the north, and the U.S. state of Montana to the south. Alberta is one of three Canadian provinces and territories to border only a single U.S. state (the others being New Brunswick and Yukon). It is also one of only two Canadian provinces that are landlocked (the other being Saskatchewan). 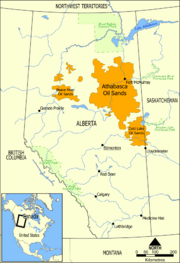 Alberta's development since the eighteenth century has been based on exploiting its natural resources, initially the fur trade, and in the latter half of the twentieth century its bitumen-containing sands. Most of the oil sands are in the sparsely populated north; about 80 percent of the population lives in the urbanized areas to the south. The capital is Edmonton, located just south of the center of the province. Edmonton is the primary supply and service hub for Canada's oil sands and other northern resource industries. The city of Calgary is a major distribution and transportation hub, in addition to being one of Canada's major commerce centers. These two metropolitan areas both exceed one million population, Calgary being slightly more populous than Edmonton. Alberta is named after the Duchess of Argyll, Princess Louise Caroline Alberta (1848–1939), the fourth daughter of Queen Victoria of the United Kingdom. Princess Louise was the wife of the Marquess of Lorne, Governor General of Canada from 1878 to 1883. Lake Louise, the village of Caroline, and Mount Alberta were also named in her honor. 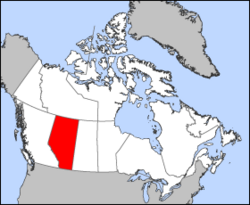 Alberta is bounded by the provinces of British Columbia (west), Saskatchewan (east), Northwest Territories (north), and the U.S. state of Montana (south). It is one of two provinces that are completely landlocked (the other being Saskatchewan). Alberta contains dozens of rivers and lakes used for swimming, water skiing, fishing, and a full range of other water sports. There are three large lakes and a multitude of smaller lakes. Part of Lake Athabasca lies in Saskatchewan. Lake Claire lies just west of Lake Athabasca in Wood Buffalo National Park. Alberta's capital city, Edmonton, is located almost in the geographic center of the province, and most of Alberta's oil is refined there. Southern Alberta, where Calgary is located, is known for its ranching. Much of the unforested part of Alberta is given over either to grain or dairy farming, with ranching and grasslands predominant in the south. The Albertan badlands in southeastern Alberta feature deep gorges and striking landforms. Dinosaur Provincial Park, near Drumheller, showcases the badlands terrain, desert plants, and remnants from Alberta's past when dinosaurs roamed the then lush landscape. Because Alberta extends for &&&&&&&&&&&01200.&&&&&01,200 km from north to south, and about 600 km wide at its greatest east-west extent, the climate varies considerably between the 49th and 60th parallels. It is also influenced by elevation, since the province is a high plateau ranging from about &&&&&&&&&&&01000.&&&&&01,000 meters in the south to 650 meters in the north. The mountains to the west and open prairies on the east also affect the weather. Moraine lake in Banff National Park. Overall, Alberta has cold winters, with a temperature average of about 14°F (−10°C) in the south to −12°F (−24°C) in the north. Northern Alberta, mostly covered by taiga boreal forest, has fewer frost-free days than southern Alberta, which has a semi-arid climate. The southeastern corner of Alberta experiences higher summer heat and lower rainfall than the rest of the province. Western Alberta is protected by the mountains and enjoys the mild temperatures brought by winter chinook winds, while southeastern Alberta is a generally flat, dry prairie with some hills, where temperatures are most extreme. They can range from very cold (−31°F or −35°C or lower in the winter) to very hot (100°F or 38°C or higher in the summer). After southern Ontario, central Alberta is the most likely region in Canada to experience tornadoes. Thunderstorms, some of them severe, are frequent in the summer, especially in central and southern Alberta. The region surrounding the Calgary-Edmonton Corridor is notable for having the highest frequency of hail in Canada, due to the role of orographic lifting from the nearby Rocky Mountains, which enhances the updraft/downdraft cycle necessary for the formation of hail. Alberta experiences a good amount of sunshine for its northern location owing to its fairly dry climate; the east-central part of the province (bordering Saskatchewan), is the sunniest place in Canada with an average of over &&&&&&&&&&&02500.&&&&&02,500 hours a year. The three climatic regions (alpine, forest, and prairie) of Alberta are home to many different species of animals. The south and central prairie was the land of the bison, its grasses providing a great pasture and breeding ground. The buffalo population was decimated during early settlement, but since then buffalo have made a strong comeback and thrive on farms and in parks all over Alberta. 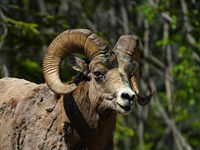 The Bighorn Sheep is Alberta's provincial animal. Alberta is home to many large carnivores. Among them are the grizzly bear and American black Bear, which are found in the mountains and wooded regions. Smaller carnivores of the dog and cat families include coyotes, wolves, foxes, lynxes, bobcats, and mountain lions (cougar). Herbivorous, or plant-eating animals, are found throughout the province. Moose and deer (both mule and white-tail varieties) are found in the wooded regions, and pronghorn antelope can be found in the prairies of southern Alberta. Bighorn sheep and mountain goats live in the Rocky Mountains. Rabbits, porcupines, skunks, squirrels, and many species of rodents and reptiles live in every corner of the province. Alberta is home to only one variety of venomous snake, the prairie rattlesnake. Central and northern Alberta and the region farther north is the nesting-ground of migratory birds. Vast numbers of ducks, geese, swans, and pelicans arrive in Alberta every spring and nest on or near one of the hundreds of small lakes that dot northern Alberta. Eagles, hawks, owls, and crows are plentiful, and a huge variety of smaller seed and insect-eating birds can be found. Rivers and lakes are well stocked with pike, walleye, whitefish, trout (Rainbow, Brook, and Brown), and even sturgeon. Turtles are found in some water bodies in the southern part of the province. Frogs and salamanders are a few of the amphibians that make their homes in Alberta. In central and northern Alberta the arrival of spring brings the prairie anemone, the avens, crocuses, and other early flowers. The advancing summer introduces many flowers of the sunflower family, until in August the plains are one blaze of yellow and purple. The southern and east-central parts of Alberta are covered by a short, nutritious grass, which dries up as summer lengthens, to be replaced by hardy perennials such as the buffalo bean, fleabane, and sagebrush. Both yellow and purple clover fill the ditches with their beauty and aromatic scents. The trees in the parkland region of the province grow in clumps and belts on the hillsides. These are largely deciduous, typically birch, poplar, and tamarack. Many species of willow and other shrubs grow in virtually any terrain. On the north side of the North Saskatchewan River evergreen forests prevail for hundreds of thousands of square kilometers. Aspen poplar, balsam poplar (or cottonwood), and paper birch are the primary large deciduous species. Conifers include Jack pine, Rocky Mountain pine, Lodgepole pine, both white and black spruce, and the deciduous conifer tamarack. The First Nations settled the plains about 8,000 years ago, sustaining themselves by hunting the buffalo. Evidence of their activities can still be seen at Head-Smashed-In Buffalo Jump, which is now a World Heritage Site in southern Alberta. These peoples included the Blackfoot, Blood, and Peigan. Another group of First Nations, including the Woodland Cree and Chippewa tribes, settled the woodland areas of central Alberta. They hunted caribou and moose and fished the lakes and rivers, using bark canoes to travel. During the nineteenth century, European fur traders married Native women. The children of these marriages are called Métis (meaning "mixed"). Writing-on-Stone Provincial Park protects the largest concentration of rock art on the North American Plains. The first European arrived in what is now Alberta in 1754. Anthony Henday, a Hudson's Bay Company fur trader, came seeking a trading agreement with the First Nations that occupied the territory. Prior to this, Alberta was part of Rupert's Land from the time of the incorporation of the Hudson's Bay Company in 1670. 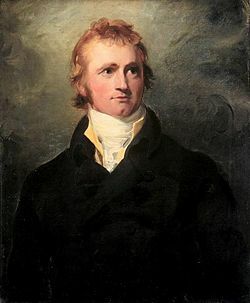 Scottish-Canadian explorer Alexander MacKenzie painted by Thomas Lawrence (c.1800), courtesy National Gallery of Canada. For the next hundred years fur trading dominated most of Alberta. From the arrival of the North-West Company in 1731, communities began to arise. Fort La Jonquière was established near what is now Calgary in 1752. The North-West Company of Montreal occupied the northern part of Alberta territory before the Hudson's Bay Company arrived to take possession of it. The first explorer of the Athabasca region was Peter Pond, who, on behalf of the North-West Company of Montreal, built Fort Athabasca on Lac La Biche in 1778. Roderick Mackenzie built Fort Chipewyan on Lake Athabasca ten years later. His cousin, Sir Alexander Mackenzie, followed the North Saskatchewan River to its northernmost point near Edmonton, then on foot trekked to the Athabasca River, which he followed to Lake Athabasca. It was there he discovered the mighty outflow river that bears his name, which he followed to its outlet in the Arctic Ocean. Returning to Lake Athabasca, he followed the Peace River upstream, eventually reaching the Pacific Ocean. He thus became the first white man to cross the North American continent north of Mexico. To compete with Alexander Mackenzie, the Hudson's Bay Company sent out surveyors Peter Fidler and David Thompson to map and explore the Athabasca and Saskatchewan Rivers. By 1790, both companies had competing posts near and across what is now northern and central Alberta. With increased competition, however, came violence, and by 1821 with some persuasion from the British government, the North-West Company merged with the Hudson's Bay Company. By 1870, the fur trade industry was rapidly declining. On June 23, 1870, the Canadian government took possession of all HBC territory (Rupert’s Land), which included the area now known as Alberta. By the late 1850s, the Canadian government had hired John Palliser and his team to explore the arable lands of Alberta. The team, also known as the "Palliser Expedition," discovered many coal deposits and passages through the Rocky Mountains appropriate for the construction of a railroad. By the 1870s, Alberta was beginning to take form with the creation of the ranching industry. In 1891, Calgary became the capital of the cattle industry and the main shipping point for livestock. By the early 1880s, the Canadian government decided to build a trans-Canada railway. Funding was made possible due to immense land grants and colonization of large farming companies across Alberta. The Canadian Pacific Railway came to Calgary in 1883. The district of Alberta was created as part of the North-West Territories in 1882. As settlement increased, local representatives to the North-West Legislative Assembly were added. 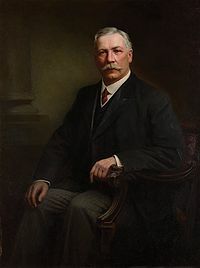 After a long campaign for autonomy, in 1905, the district of Alberta was enlarged and given provincial status, with Alexander Cameron Rutherford elected as the first premier. After provincial status was enacted, four major controversies arose. The federal government had imposed the following conditions: That the francophone Roman Catholic population would be entitled to separate schools; the boundary between Saskatchewan and Alberta would be set at 110º west longitude; Edmonton would receive capital status rather than Calgary; and the federal government would retain control over the Crown lands and natural resources. Through the early 1900s, the political movement known as the United Farmers of Alberta (UFA) was created to provide support to those farmers that felt the pressure of poverty due to the triads of railways, grain-elevator companies, and banks. The UFA would retain political control of the province until 1935, when William Aberhart’s Social Credit League overtook leadership of the province. Although the Great Depression dismantled much of the UFA, C.H. Douglas presented the theory that it was the government's responsibility to create social structures that would ensure that capital would not fall into a few powerful hands. With this theory of thought Aberhart created the Social Credit Party, which many farmers and miners embraced. Although oil and natural gas had been discovered earlier, the discovery of the Leduc Oilfield in 1947 initiated an economic explosion throughout Alberta. Due to this find, Alberta has since relied heavily on the oil and gas industry to support the province. Alberta's Legislative Building in Edmonton. The government of Alberta is organized as a parliamentary democracy with a unicameral legislature. Its unicameral Legislative Assembly consists of 83 members. Locally municipal governments and school boards are elected and operate separately. Their boundaries may or may not coincide. Municipalities, where the same body acted as both local government and school board, were formally referred to as "counties" in Alberta. As Canada's head of state, Queen Elizabeth II is the head of state for the Government of Alberta. Her duties in Alberta are carried out by a Lieutenant Governor. Although the lieutenant governor is technically the most powerful person in Alberta, (s)he is in reality a figurehead whose actions are restricted by custom and constitutional convention. The government is therefore headed by the premier of Alberta. As is the case in a parliamentary system, the premier is a member of the Legislative Assembly, and he draws all the members of his cabinet from among the members of the Legislative Assembly. 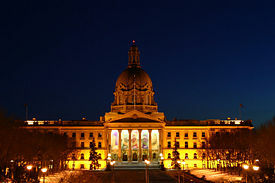 The City of Edmonton is the seat of the provincial government—the capital of Alberta. The province's revenue comes mainly from the taxation of oil, natural gas, beef, softwood lumber, and wheat, but also includes a tax on corporate and personal income, gaming revenue, and grants from the government of Canada, primarily for infrastructure projects. Albertans are the lowest-taxed people in Canada, and Alberta is the only province in Canada without a provincial sales tax (though residents are still subject to the federal sales tax, the Goods and Services Tax). Alberta's municipalities and school jurisdictions have their own governments, which (usually) work in cooperation with the provincial government. Alberta's elections tend to yield results that are much more conservative than those of other Canadian provinces. Alberta has traditionally had three political parties, the Alberta Progressive Conservatives ("Conservatives" or "Tories"), the Liberals, and the New Democratic Party. A fourth party, the strongly conservative Social Credit Party, was a power in Alberta for many decades but fell from the political map after the Progressive Conservatives came to power in 1971. Since that time, no other political party has governed Alberta. In fact, only four parties have governed the province: The Liberals, from 1905 to 1921; the United Farmers of Alberta, from 1921 to 1935; the Social Credit Party, from 1935 to 1971, and the currently governing Progressive Conservative Party, from 1971 to the present. As is the case with many western Canadian provinces, Alberta has had occasional surges in separatist sentiment. Even during the 1980s, when these feelings were at their strongest, there has never been enough interest in secession to initiate any major movements or referenda. There are a number of groups wishing to promote the independence of Alberta in some form currently active in the province. In the Alberta 2004 provincial election, the Progressive Conservative Party was re-elected as a majority government (62 members), the Liberal Party of Alberta was elected as the official opposition (16 members), the New Democratic Party elected 4 members, and the Alberta Alliance Party, running to the right of the Conservatives, won 1 seat. The Athabasca Oil Sands in Alberta are a major source of bituminous sands. Alberta's economy is one of the strongest in Canada, supported by the burgeoning petroleum industry and to a lesser extent,agriculture and technology. The per capita GDP in 2005 was by far the highest of any province in Canada at Canadian dollar $66,279. This was 56 percent higher than the national average and more than twice that of some of the Atlantic provinces. This deviation from the national average was the largest for any province in Canadian history. The Calgary-Edmonton Corridor is the most urbanized region in the province and one of the densest in Canada. In 2001, the population of the Calgary-Edmonton Corridor was 2.15 million (72 percent of Alberta's population). It is also one of the fastest-growing regions in the country. A 2003 study by TD Bank Financial Group found the corridor is the only Canadian urban center to amass a U.S. level of wealth while maintaining a Canadian-style quality of life, offering universal health care benefits. The study found GDP per capita in the corridor is 10 percent above average U.S. metropolitan areas and 40 percent above other Canadian cities. Other major but much smaller municipalities include Red Deer, Lethbridge, Medicine Hat, Fort McMurray, Grande Prairie, Camrose, Lloydminster, Wetaskiwin, Banff, and Jasper. According to the Fraser Institute, Alberta also has very high levels of economic freedom. It is by far the most free economy in Canada and is rated as the fourth most free economy of U.S. states and Canadian provinces. Alberta is the largest producer of petroleum conventional crude oil, synthetic crude, natural gas and gas products in the country. Two of the largest producers of petrochemicals in North America are located in central and north-central Alberta. In both Red Deer and Edmonton, world-class polyethylene and vinyl manufacturers produce products shipped all over the world, and Edmonton's oil refineries provide the raw materials for a large petrochemical industry to the east of Edmonton. The Athabasca Oil Sands have estimated non-conventional oil reserves approximately equal to the conventional oil reserves of the rest of the world. With the development of new extraction methods such as steam-assisted gravity drainage (SAGD), which was developed in Alberta, bitumen and synthetic crude oil can be produced at costs close to those of conventional crude. Many companies employ both conventional surface mining, strip mining, and non-conventional in situ methods to extract the bitumen from the oil sands. With current technology and at current prices, about 315 billion barrels (50 km³) of bitumen are recoverable. Fort McMurray, one of Canada's fastest growing and liveliest cities, has grown enormously in recent years because of the large corporations involved in oil production. Another factor determining the viability of oil extraction from the oil sands is the price of oil. The oil price increases of recent years made it more profitable to extract this oil, which in the past would give little profit or even a loss. Agriculture has a significant position in Alberta's economy. Approximately, 24 percent of Canada's annual agricultural output comes from Alberta; its 57,000 farms and ranches are a large employer of many Albertans. Nearly half of all Canadian beef is produced in Alberta. Alberta annually exports 64 percent of its commodities to over 130 countries. Wheat and canola are the primary crops, with Alberta leading the provinces in spring wheat production. Much of the farming is dryland farming, often with fallow seasons interspersed with cultivation. Continuous cropping (in which there is no fallow season) is gradually becoming a more common mode of production because of increased profits and a reduction of soil erosion. Alberta is also the leading beekeeping province of Canada, with some beekeepers in southern Alberta wintering beehives indoors in specially designed barns. They then migrate north during the summer into the Peace River valley where the season is short but the working days are long for the Western honey bee to produce honey. Hybrid canola also requires bee pollination, which some beekeepers service. The vast northern forest reserves of softwood allow Alberta to produce large quantities of lumber, oriented strand board (OSB), and plywood. Other plants supply North America and the Pacific Rim nations with bleached wood pulp and newsprint. Alberta has been a tourist destination from the early days of the twentieth century, with attractions including outdoor locales for skiing, hiking, and camping, shopping locales such as West Edmonton Mall, outdoor festivals, professional athletic events, and international sporting competitions such as the Commonwealth Games and Olympic Games, as well as more eclectic attractions. According to Alberta Economic Development, Edmonton and Calgary both host over four million visitors annually. 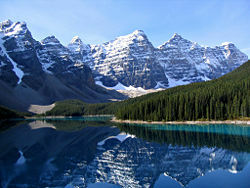 Banff National Park, Jasper National Park, and the Rocky Mountains are visited by about three million people per year. The two mountain parks are connected by the scenic Icefields Parkway. About 1.2 million people pass through the gates of Calgary's world-famous Calgary Stampede, a celebration of Canada's own Wild West and the cattle ranching industry. About 800,000 people enjoy Edmonton's Capital Ex (formerly Klondike Days). Edmonton was the gateway to the only all-Canadian route to the Yukon gold fields, and the only route that did not require gold-seekers to travel the exhausting and dangerous Chilkoot Pass. Located in east-central Alberta is Alberta Prairie Railway Excursions, a popular tourist attraction operated out of Stettler that draws visitors from around the world. It boasts one of the few operable steam trains in the world, offering trips through the rolling prairie scenery. Alberta Prairie Railway Excursions caters to 10's of thousands of visitors every year. Alberta is an important destination for tourists who love to ski and hike; Alberta boasts several world-class ski resorts such as Sunshine Village, Lake Louise Mountain Resort, Marmot Basin, Mount Norquay, and Nakiska. Hunters and fishermen from around the world are able to take home impressive trophies and tall tales from their experiences in Alberta's wilderness. The main north-south corridor in Alberta is the provincial Highway 2, which begins south of Cardston at the Carway border crossing and is part of the CANAMEX corridor. Alberta Highway 4, which effectively extends U.S. Interstate Highway 15 into Alberta and is the busiest U.S. gateway to the province, begins at the Coutts border crossing and ends at Lethbridge. Alberta provincial Highway 3 joins Lethbridge to Fort Macleod and links Alberta provincial highway 4 to Alberta provincial Highway 2. Alberta has two main east-west corridors. The southern corridor, part of the Trans-Canada Highway system, enters the province near Medicine Hat, Alberta, runs westward through Calgary, and leaves Alberta through Banff National Park. The northern corridor, also part of the Trans-Canada network but known alternatively as the Yellowhead Highway (Alberta Highway 16), runs west from Lloydminster in eastern Alberta, through Edmonton and Jasper National Park into British Columbia. Edmonton, Calgary, Red Deer, Medicine Hat, and Lethbridge have substantial mass transit systems. Edmonton and Calgary also operate light rail vehicles. Alberta is well-connected by air, with international airports at both Edmonton and Calgary. Calgary International Airport and Edmonton International Airport are the fourth and fifth busiest airports in Canada. Calgary's airport primarily serves the Canadian prairie provinces (Alberta, Saskatchewan, and Manitoba) for connecting flights to British Columbia, eastern Canada, 15 major U.S. centers, nine European airports, and four destinations in Mexico and the Caribbean. Edmonton's airport acts as a hub for the Canadian north and has connections to all major Canadian airports as well as 9 major U.S. airports, 3 European airports and 6 Mexican and Caribbean airports. There are over 9,000 km of railroad, and many tourists see Alberta aboard via rail. The Canadian Pacific Railway company operates freight lines across the province. As with any Canadian province, the Albertan Legislature has (almost) exclusive authority to make laws respecting education. Since 1905 the Alberta School Act has used this capacity to continue the model of locally elected public and separate school boards which originated prior to 1905, as well as to create and/or regulate universities, colleges, technical institutions, and other educational forms and institutions (public charter schools, private schools, home schooling). There are forty-two public school jurisdictions in Alberta, and seventeen operating separate school jurisdictions. Sixteen of the operating separate school jurisdictions have a Roman Catholic Church electorate, and one (St. Albert) has a Protestant electorate. In addition, one Protestant separate school district, Glen Avon, survives as a ward of the St. Paul Education Region. Public school and separate school boards, charter schools, and private schools all follow the Program of Studies and the curriculum approved by the provincial department of education (Alberta Education). Home schoolers may choose to follow the Program of Studies or develop their own Program of Studies. Alberta's oldest and largest university is Edmonton's University of Alberta. The University of Calgary, once affiliated with the University of Alberta, gained its autonomy in 1966 and is now the second largest university in Alberta. There are also Athabasca University, which focuses on distance learning, and the University of Lethbridge. Fifteen colleges receive direct public funding, along with two technical institutes, Northern Alberta Institute of Technology (NAIT) and Southern Alberta Institute of Technology (SAIT). There is also a large and active private sector of post-secondary institutions, including DeVry University. 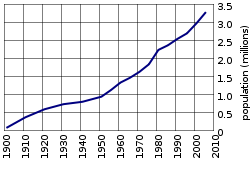 Alberta's population has grown steadily for over a century. Alberta has experienced the greatest population growth among Canada's provinces since 1997, due to a combination of relatively high natural increase and a considerable increase in inter-provincial as well as international migration as a result of its burgeoning economy. As of April 2007, the estimated population was 3,455,062, of whom 81 percent lived in urban areas. The Calgary-Edmonton Corridor is the most urbanized area in the province and one of the densest in Canada. Most Albertans identify as "Canadian" (27.66 percent) and English (25.61 percent), with large groups of German (19.60 percent), Scottish (18.92 percent), Irish (15.68 percent), French (11.31 percent), and Ukrainian (9.71 percent). Alberta is home to speakers of a number of languages, with many minority languages growing due to immigration. English remains the only official language used in all government services, although French is also an official language of the courts. Alberta is home to the second highest proportion (2.7 percent) of Francophones in western Canada (after Manitoba). Both the Chinese Canadian and Indo-Canadian communities represent a large bloc of Alberta's population. Both Edmonton and Calgary have Chinatowns, with Calgary's being the third largest in Canada. Aboriginal peoples in Alberta make up approximately 3 percent of the population. Most Albertans identify as Christian. Alberta has a somewhat higher percentage of evangelical Christians than other provinces. Conversely, Alberta also has the second highest percentage of non-religious residents in Canada (after British Columbia): 44 percent do not attend church. Members of the Church of Jesus Christ of Latter-day Saints reside primarily in the extreme south of the province. 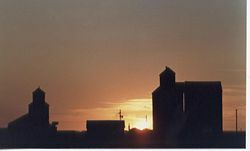 Alberta also has a large population of Hutterites, a communal Anabaptist sect similar to the Mennonites, and a significant population of Seventh-day Adventists. Alberta is also home to several Byzantine Rite churches as part of the legacy of Eastern European immigration, including the Ukrainian Catholic Eparchy of Edmonton and the Ukrainian Orthodox Church of Canada's Archbishop of Edmonton and Western Canada, which is based in Edmonton. Many people of the Hindu, Sikh, and Muslim faiths also make Alberta their home. North America's oldest mosque is located in Edmonton. Most of Alberta's nearly 13,000 Jews live in Calgary (7,500) and Edmonton (5,000). Summer brings many festivals to the province. The Edmonton Fringe Festival is the world's second largest after Edinburgh's. The folk music festivals in both Calgary and Edmonton are two of Canada's largest, and both cities host a number of annual multicultural events. With a large number of summer and winter events, Edmonton prides itself as being the "Festival City." The city's "heritage days" festival sees the participation of over 70 national groups. Calgary is also home to Carifest, the second largest Caribbean festival in the nation (after Caribana in Toronto). The city is also famous for its Calgary Stampede, Canada's biggest rodeo festival. These events highlight the province's cultural diversity and love of entertainment. Most of the major cities have several performing theater companies. Both cities are home to Canadian Football League (Calgary Stampeders) and National Hockey League (Calgary Flames) teams. Soccer, rugby union and lacrosse are also played professionally in Alberta. Alberta contains the second largest proven concentration of oil in the world, the vast majority of which is found in oil sands deposits. There are 173 billion barrels of oil in the oil sands proven to be recoverable with today’s technology and under current economic conditions. In addition, there is an estimated total of 315 billion barrels of potentially recoverable oil in the oil sands. The oil sands are a key driver of the economy in Alberta, other provinces, and at a national level. From 2003–2004 to 2006–2007, oil sands development returned $4.276 billion to Albertans in the form of royalties paid to the provincial government. Like all mining and non-renewable resource development projects, oil sands operations have an effect on the environment. Oil sands projects affect the land when the bitumen is initially mined and with large deposits of toxic chemicals; the water during the separation process and through the drainage of rivers; and the air due to the release of carbon dioxide and other emissions, as well as deforestation. Additional indirect environmental effects are that the petroleum products produced are mostly burned, releasing carbon dioxide into the atmosphere. A large part of oil sands mining operations involves clearing trees and brush from a site and removing the "overburden"—the topsoil, muskeg, sand, clay, and gravel—that sits atop the oil sands deposit. As a condition of licensing, projects are required to implement a reclamation plan. The mining industry asserts that the boreal forest will eventually colonize the reclaimed lands. As of 2006–2007, about 420 km² (160 sq mi) of land in the oil sands region have been disturbed, and 65 km² (25 sq mi) of that land is under reclamation. Through the Alberta Energy Research Institute, the Alberta government is working to spur new technology that will reduce the impact of greenhouse gases and other emissions and reduce the consumption of water and gas. The government has established an Oil Sands Environmental Management Division specifically to enhance environmental protection during oil sands development. ↑ Statistics Canada (January 24, 2012). Population and dwelling counts, for Canada, provinces and territories, 2011 and 2006 censuses. Retrieved June 18, 2012. ↑ Statistics Canada (November 8, 2011). Real gross domestic product, expenditure-based, by province and territory. Retrieved June 18, 2012. ↑ Statistics Canada, November 2006, Gross domestic product, by province and territory. Retrieved January 21, 2009. ↑ Statistics Canada, September 2006, The Alberta economic Juggernaut: The boom on the rose. Retrieved January 21, 2009. ↑ Statistics Canada, Calgary-Edmonton corridor. Retrieved January 21, 2009. ↑ Karabegović, Amela, Fred McMahon, and Christy G. Black, 2006, Economic freedom of North America 2006 annual report, (Vancouver, BC: Fraser Institute, ISBN 0889752133). Retrieved January 21, 2009. ↑ Mark Zuehlke, The Alberta Fact Book (Whitecap Books: Vancouver, 1999), 182. ↑ Government of Alberta, FAQ—Oil Sands. Retrieved January 21, 2009. Bakken, Edna. Discover Canada: Alberta. Grolier Limited, 1996. ISBN 978-0516066110. Barr, B. M. and P.J. Smith. Environment and Economy: Essays on the Human Geography of Alberta. The University of Alberta Press, 1984. ISBN 978-0888640420. Breen, David. Alberta's Petroleum Industry and the Conservation Board. The University of Alberta Press, 1993. ISBN 978-0888642455. Harrison, Trevor, and Jerrold Kachor. Contested Classrooms: Education, Globalization, and Democracy in Alberta. The University of Alberta Press, 1999. ISBN 978-0888643155. Palmer, Howard. Alberta: A New History. Hurtig Publisher, 1990. ISBN 978-0888303400. Tupper, Allan, and Roger Gibbins. Government and Politics in Alberta. The University of Alberta Press, 1992. ISBN 978-0888642431. Zuehlke, Mark. The Alberta Fact Book. Whitecap Books, 1997. ISBN 978-1551105451. All links retrieved November 8, 2016. This page was last modified on 18 February 2019, at 20:53.